Goddess Yoga, as taught in the tradition of Goddess Yoga International, is a fusion of VINYASA YOGA, BELLYDANCE, Kundalini inspired BREATHWORK, and guided MEDITATION. Awaken your INNER GODDESS through the art of SACRED and SENSUAL MOVEMENT, vibrant MUSIC, Goddess ORACLE CARDS, high quality ESSENTIAL OILS, and the healing power of CRYSTALS and SEMI-PRECIOUS STONES. Goddess Yoga fosters SISTERHOOD and CONNECTION with other women, EMPOWERING WOMEN to experience their own STRENGTH and BEAUTY, inside and out. By combining the wisdoms of many ancient traditions, Goddess Yoga has the power to help women HEAL OLD TRAUMAS, ENGAGE in NEW WAYS of THINKING, feel ALIVE, RADIANT, and SENSUAL, and have lots of FUN doing it. Goddess Yoga is ideal for women who are struggling with a negative body image, healing from sexual abuse, and women who are postpartum or are trying to conceive, or women who want to connect with their sensuality and to love themselves, inside and out. With regard to pregnancy and Goddess Yoga, it is not recommended that you start any new physical activity while pregnant, and so, Goddess Yoga is only recommended for prenatal women if they have already been practicing Goddess Yoga for some time. 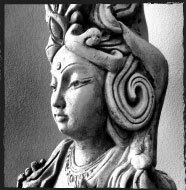 GODDESS YOGA EXPERIENCE WORKSHOP: a workshop series of seven 90 minute classes that incorporate the same elements as the Goddess Yoga Class (yoga/bellydance flow, essential oils, guided meditation, and oracle cards) as well much, much more. Through guided WRITING EXERCISES and GROUP SHARING, participants of the Goddess Yoga Experience learn to MEDITATE like a GODDESS, MOVE like a GODDESS, and MANIFEST like a GODDESS. Each class will focus on BALANCING each of the seven CHAKRAS, the seven energy centers of the body, and include the use of ESSENTIAL OILS and SEMI-PRECIOUS STONES associated with each chakra. Currently offered every other Tuesday evening from 5:00pm - 6:30pm, starting Sept. 12, 2017. Exact dates: Sept. 12 (Root Chakra) and Sept. 26 (Sacral Chakra), Oct. 10 (Solar Plexus Chakra) and Oct. 24 (Heart Chakra), Nov. 7 (Throat Chakra) and Nov. 21 (Brow Chakra), and Dec. 5 (Crown Chakra), 2017. Workshop price: $160.00. Drop-in price: $24.00/90 minute class (Cash only). Price includes materials and use of essential oils. Drop-in price: $18/class. Please download and complete the Goddess Yoga Liability Waiver and bring it to your first class. PLEASE BRING YOUR OWN YOGA MAT TO CLASS, if you have one. While some yoga mats are available for students to use, there are not enough for an entire class. Studio 1/A (upstairs), Creative Crossing, 2526 Agricola St. Halifax, NS.